Heat the ghee in a heavy based pan, and add the jeera and the heeng. When the seeds begin to splutter, add the ginger and sauté to a light brown. 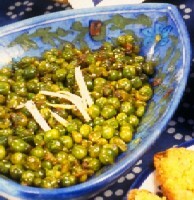 Add the peas, dhania powder, mango powder, garam masala and salt and sauté over high heat till they look glossy. Lower the heat and simmer till the peas are cooked but `bite like' . Serve hot, mixed with the hara dhania.